I have long been a fan of Google’s Pixel line of Chromebooks, but today at the Google Nexus event I saw the Pixel C and finally fell in love. But unfortunately, this machine isn’t as pretty on the inside as it is on the outside. Let’s start with the good things. At 10.2 inches, the Pixel C is a compact, Surface-style tablet computer — lightweight, slim, and small enough to slide into your day pack. Interestingly, Google is pricing the tablet separately from the keyboard (they’ll start at $499 and $149 respectively). Maybe it’s because they think you’ll want to buy the tablet on its own, or maybe because they’re hinting at alternate keyboards to come. The handfeel of the device is stellar. It’s held together with magnets, and you’ll want to slide the tablet off the keyboard before separating it with a satisfying snap. The device has a sense of heft without added weight. You attach the tablet to the keyboard by gently thwacking it against the top of the keyboard and bending a magnetized stand forward. There’s none of that house-of-cards feeling you get with the Surface, or some of those crappy iPad stands. I couldn’t stop snapping it together, sliding the pieces against each other, and yanking it apart again. It just felt right for a mobile device that’s as powerful as a desktop. While we’re on handfeel, though, let’s talk about that scaled-down keyboard that has to fit the Pixel C’s 10.2-inch form factor. Yes, it feels a little small — and the enter key is in a weird spot. That said, the delete key is far easier to reach, and I didn’t particularly miss the function and symbol keys they had to remove to slim the whole thing down. Once I’d typed for a couple of minutes, I was used to the layout, and the keys themselves felt slightly soft but offered enough resistance to be satisfying. Yep, it’s a bluetooth keyboard, but the good news is that it charges inductively when its stuck to the tablet — itself charging with (of course) USB-C. The display was pretty good, with 308 ppi and nice backlighting that goes up to 500 nits. I could easily imagine watching movies on it, or just updating a post on Gizmodo. As I mentioned earlier, however, there was one snag. The Pixels were introduced as a premiere Chromebook line, but the Pixel C is running Android Marshmallow. Wait, what? There are a lot of reasons why the company decided to take this weird U-turn, but what it means for you is that there is no touchpad on the keyboard because Android still has lingering issues with touchpad cursor positioning. You’d think this would be no big deal, given that you’ve got a touchscreen right there — but if you are typing in a document, it can get a little annoying to have to move the cursor with your fat fingers. Plus, as Ars Technica’s Ron Amadeo pointed out, the Chrome browser just isn’t going to run as smoothly on Android as it would have on Chrome OS. That said, you can now download apps for your erstwhile Chromebook (Androidbook? ), since the Pixel C will run tablet apps from the Play Store. The other weird thing? 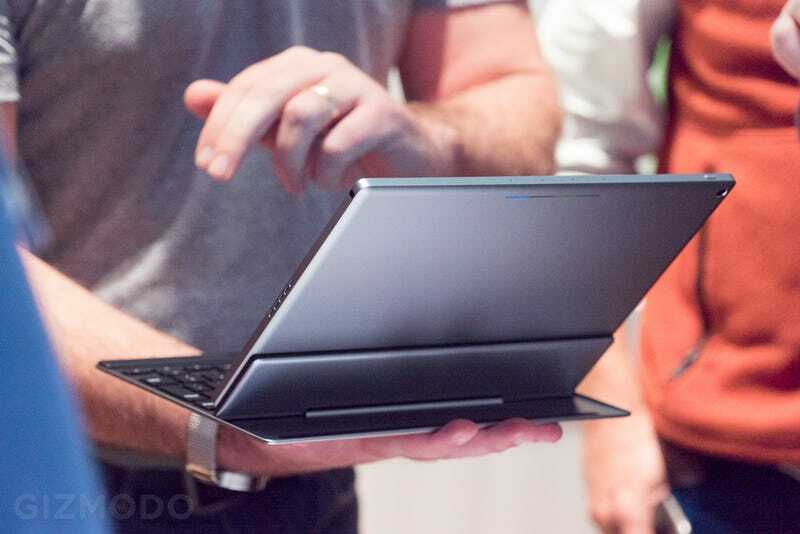 Unlike previous Pixels, the Pixel C isn’t running on Intel processors — instead, you’re looking at an Nvidia. This is a bit of a head-scratcher. I think what sold me on the Pixel C, though, was the form factor. It felt like a fully realized version of the tablet computer. Certainly there are many worthy tablet PCs out there, with more functional keyboards and more, um, appropriate operating systems. But the Pixel C gave me the ineffable sense that I was holding both a mobile device and something more substantive, like a laptop. I think partly that was due to the excellent display, but it was also just about how it felt in my hands — light and solid. Google promises to make the Pixel C available “before the holidays” in the Google Store. We’ll see if this foxy form factor with its odd innards will sell.